Barcelona defeated Real Madrid by 3-2 in the 2nd leg of the Spanish Cup and takes the trophy home, after having drawn 2-2 in the Santiago Bernabeu. Cristiano Ronaldo scored his 100th goal for Real Madrid, but Lionel Messi led Barcelona to the victory, scoring 2 goals. 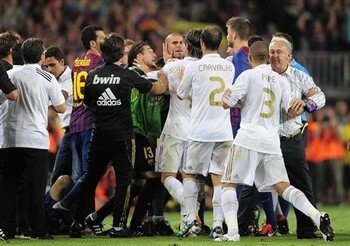 Real Madrid started the game with a clear strategy of pressuring Barcelona right away. José Mourinho men fought like soliders and manage to suffocate Barcelona, not allowing the Blaugrana to complete 3 passes in the first 10 minutes. However, and as the time passed, Real Madrid slowed down and Lionel Messi took his first opportunity to dribble two defenders and assist Iniesta for the first goal of the match. Real Madrid knew that from that point on, that they would need to score at least 2 goals to still dream of winning the trophy. 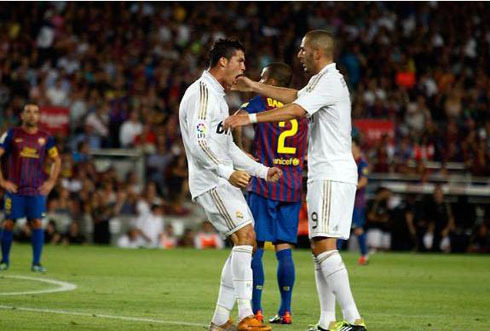 The reaction took place just 5 minutes after, with Cristiano Ronaldo majestically deflecting a cross made by Benzema. With the 1-1 draw on the scoreline, Barcelona still had the advantage because the Blaugrana had achieved a 2-2 draw last Sunday, in the Santiago Bernabeu. However, the game kept wide open, with both teams creating danger. Pedrito forced Casillas to make a tremendous save in the 22th minute and Cristiano Ronaldo had a great shot close to the 24th minute, but it collided with the crossbar, after a slight deflection from Victor Valdes. One of the key moments of the game happened near the halftime, when after a Barcelona's corner kick, Piqué assisted Lionel Messi with a backheel pass, and the Argentinian finished the play with class, making it 2-1. The 2nd half came and Mourinho didn't lose time. Marcelo replaced Sami Khedira who had already seen a yellow card and the Merengues went looking for a 2nd goal that would draw this final. However, Barcelona ball possession no had much more quality when compared to the first half, and the team was managing to keep the ball in a more safe way, forcing Real Madrid to struggle and not creating so many goal scoring chances. 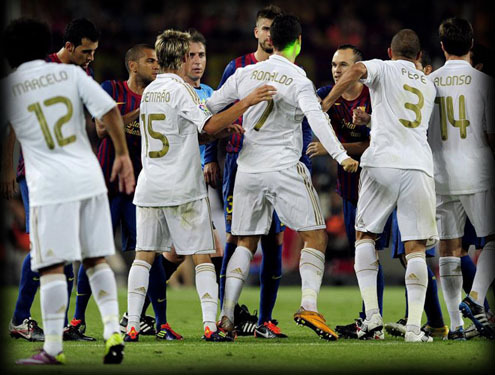 Lots of fouls and small fights took place and Mascherano, Cristiano Ronaldo, Pepe and Adriano were also shown the yellow card. Around the 80th minute, Karim Benzema finally found the back of the net and put the score in 2-2, putting everything even. The French finished a confusing play originated from a corner and made the Merengues believe again that it was still possible to beat Barcelona in the Camp Nou. However, close to the 86th minute, the little man from Barcelona, Lionel Messi, found strenghts to make one last intervention in the game and scored the 3-2, putting an end to Real Madrid hopes. Around the 94th minute, and just 1 minute before the match ended, all the anxiety and tension blew up. Fabregas received the ball close to the side-line and Marcelo didn't hold himself and fouled him from behind with a scissors tackle. The referee whistled and immediatly showed the Brazilian the red card. What happened next was the result of so much tension accumulated from so many matches ("El Clasicos"), between Real Madrid and Barcelona in the last months. 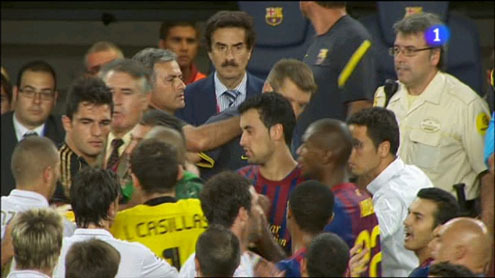 A big mess was generated from this incident and a few aggressions were witnessed and captured by the TV cameras. In what was an avoidable moment, players and coaching staff were seen "assaulting" and hitting each other, in several fights. Real Madrid line-up: Casillas, Sergio Ramos, Pepe, Ricardo Carvalho, Fábio Coentrão, Xabi Alonso, Khedira, Di María, Ozil, Cristiano Ronaldo and Benzema. Barcelona line-up: Victor Valdés, Daniel Alves, Piqué, Javier Mascherano, Abidal, Busquets, Xavi, Iniesta, Lionel Messi, David Villa and Pedrito.